By William Truswell, M.D., Jon Mendelsohn, M.D., Harrison C. Putman III, M.D., Paul S. Nassif, M.D., David Ellis, M.D. William Truswell, M.D., Jon Mendelsohn, M.D., Harrison C. Putman III, M.D., Paul S. Nassif, M.D., David Ellis, M.D. Is your nose too large? Too small? Is it crooked? Perhaps you have a hump in the bridge of your nose. If you’re unhappy with your nose, you have probably thought about having rhinoplasty, the medical term for what is commonly called “nose reshaping” or a “nose job.” And, you’re not alone—some 300,000 people have nose reshaping procedures each year. In fact, it is the second most popular plastic surgery procedure being performed by facial plastic surgeons in the United States. How do you choose the right surgeon? What kind of anesthesia is used during surgery? Will you have pain after the surgery? Will your nose be bandaged? If so, how long? How soon can you resume work and physical exercise? 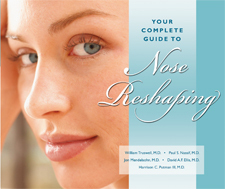 Your Complete Guide to Nose Reshaping contains 102 color photographs and illustrations. Glossary, Index, and Resource section.